General Licensing: Where Are My Royalties? 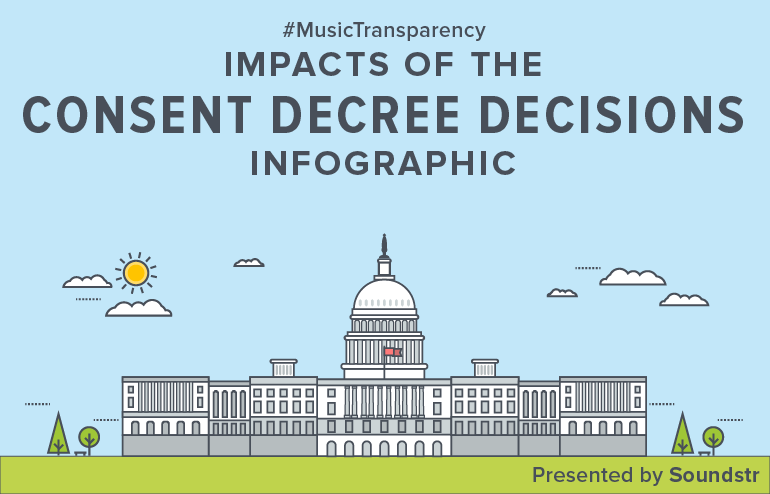 We encourage you to share this infographic image or download a printable PDF (with links), along with the hashtag #MusicTransparency on Facebook, Twitter and beyond. We kindly ask that you use it in its entirety and do not edit in any way. Thank you for respecting our work. Soundstr uses recognition technology to identify real-world music usage and offers new advertising opportunities for businesses and songwriters. 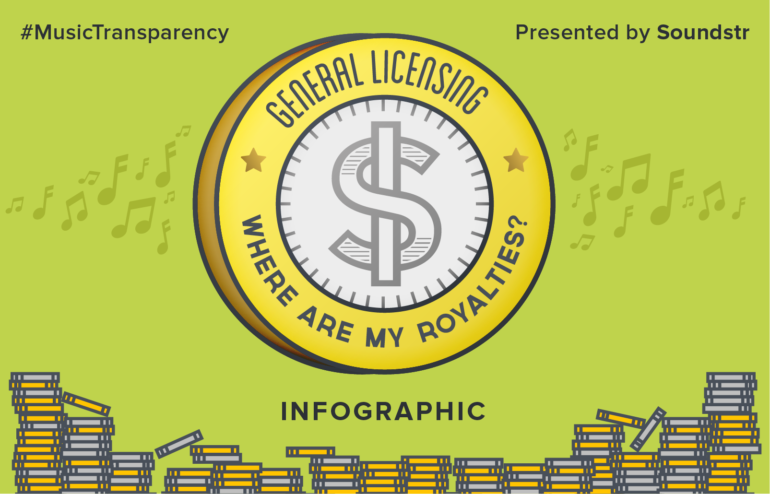 This transparency offers businesses a way to negotiate PRO license fees based on actual music usage, and songwriters a way to earn royalties when their music is used in the real world. 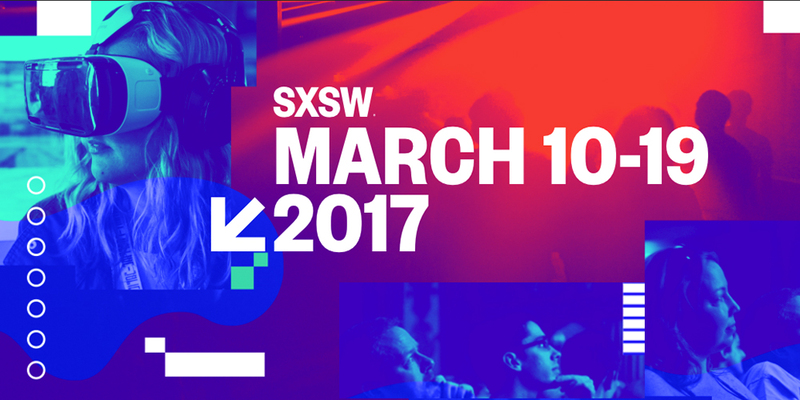 Soundstr is a venture-backed startup, founded by songwriters and leverages best-in-class recognition technology by Gracenote (Nielsen). Click here to learn more about Soundstr. 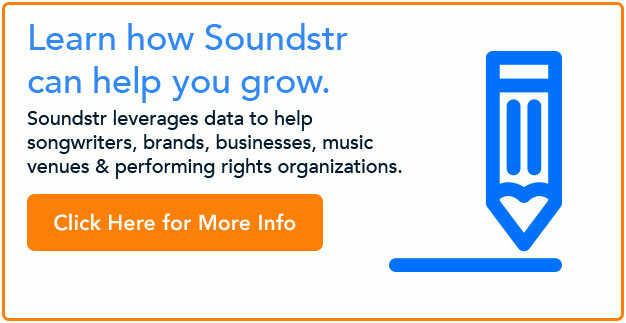 Soundstr uses recognition technology to identify real world music usage and offers new advertising opportunities for businesses and songwriters. 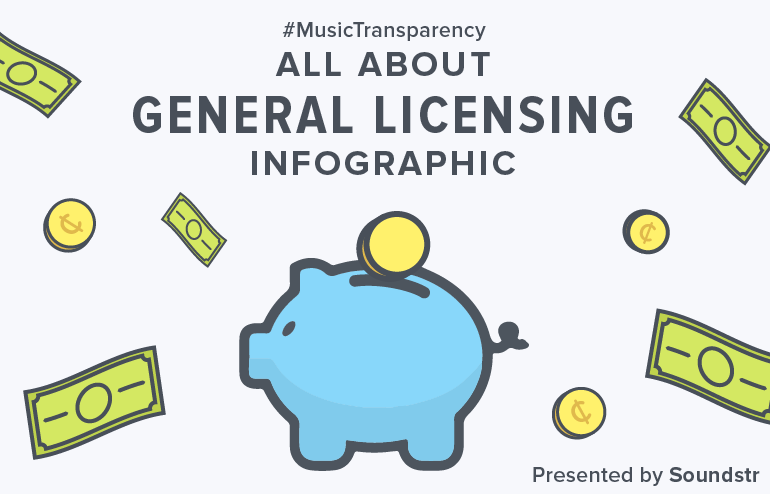 This transparency offers businesses a way to negotiate PRO license fees based on actual music usage, and songwriters a way to earn royalties when their music is used in the real world. Soundstr is a venture-backed startup, founded by songwriters and leverages best-in-class recognition technology by Gracenote (Tribune). Click here to learn more about Soundstr. #7: Assumes background providers pay $50 per location per year to each ASCAP and BMI. This is higher than adjudicated rates to account for unaccounted variables in the estimated breakdown. Breakdown assumes 50,000 locations from PlayNetwork and 400,000 US locations from Mood Media. PlayNetwork operates 110,000 locations in 110 countries. Mood Media operates 500,000 locations in 100 countries. Neither offers breakdowns by country. #9: Some of these songwriters had songs on the radio during this time period and within the market. Those songs were not ones identified in the study’s test sites and therefore these songwriters would not receive compensation for the use of those specific songs. Editor’s Note: This infographic is intended to visualize the recent decisions made by the Department of Justice for the Consent Decrees. For more information on these decisions and how they could impact songwriters, please check out our post, “5 Things Songwriters Need to Know About the Consent Decree.” This post originally appears on the Soundstr Blog. Why doesn’t your business use music in your marketing? There are a lot of myths surrounding this concept. Do you think it costs too much? Are you not sure if your customers would appreciate it? Or are you just not familiar enough with how you could use music within your marketing? The simple truth is that music is easier to use commercially than you might think. Music has become such a big part of our lives, with the average person listening to music 4 hours each day. Music also evokes emotional responses in listeners, which is absolutely utilized in advertising. HP used a Meghan Trainor song around a tablet advertisement, and the campaign generated a 26% increase in just 12-weeks. Now how about that bass? If you’re not already convinced, see below for 5 reasons why your business should use music in your marketing efforts. 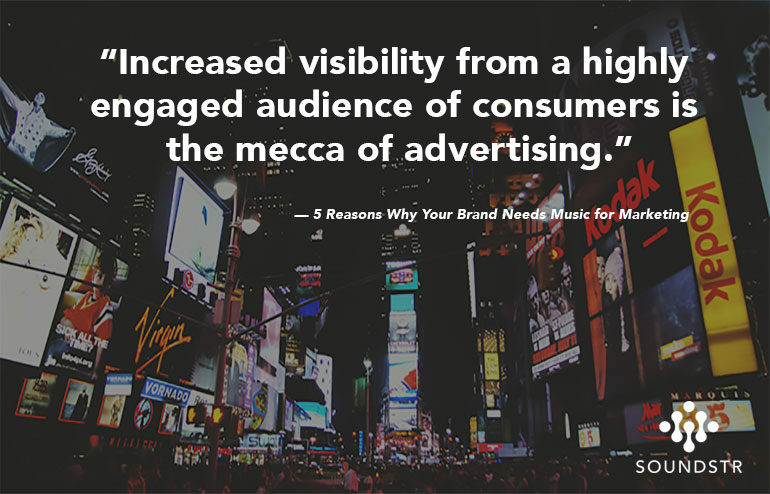 One of the main reasons to use music in your marketing is visibility. Solo artists and bands have fans of their own, and those fans are consumers. From small social campaigns to lifelong endorsements, marketing with music will increase your visibility. Music fans are loyal. From downloading music to attending live events and purchasing merchandise, fans are always consuming. They also exhibit high levels of engagement, especially on social media. Have you ever compared your social media traction to that of an artist with a similar-sized following? The difference is staggering, showcasing a reason in itself to use music in marketing. Yes, advertising with music will cost you something, as nothing in life is free. But what you might not consider is how scalable this cost can be, along with your options. If you want to align with an artist that’s sold millions of albums, it might cost you millions. But, local and regional artists – many of whom will become larger, successful artists – are a great alternative. Local artists on the rise have high levels of engagement and loyalty because their audience is a mix of fans and friends. Plus, the cost of aligning your brand with a local artist is much more affordable than you think. In Cincinnati, MusicLi helps businesses use local music for marketing, with song licensing starting at just a few hundred dollars. Music in marketing can be a unique way to drive attention to your business or a specific good/service. Pairing your business with an appropriate artist can help drive interest in what you offer. Does your business sell sustainable goods or merchandise like a local Whole Foods? Many artists, from folk to indie and hip-hop, are teaching their audience about sustainability. Now imagine you are trying to market a new locally-sourced energy bar or water bottle. Why not pair with a local eco-conscious artist to offer to drive sales? This could be a free download of their new single with each sale, or a marketing video with using their song. This is just a simple example, but it could be effective in driving visibility and sales. The music industry is big, and growing by the day. Social media has removed almost all barriers to entry, allowing anyone to become a successful artist. This process, which used to take years of development, can happen almost overnight. This can work in a businesses favor as well. Imagine having an energy drink that uses a local hard rock artist’s music in your marketing video. Say the band shoots their own music video, and they choose to drink your product in the video. Then the video goes viral. You may decide to further your relationship with the band and sponsor which states they drink your product on stage at shows. Now their song has become a hit on the radio, and they go on a world tour. Your visibility from sponsoring the band could help grow your business into a worldwide empire. It might sound unrealistic, but it might be more probable than you think. There are plenty of reasons why your business should consider using music in your marketing. Increased visibility from a highly engaged audience of consumers is the mecca of advertising. Using local and regional artists is a great alternative to expensive national artist campaigns. Working with emerging artists can also lead to new and exciting opportunities to grow with musicians. So the only question is – what are you waiting for? 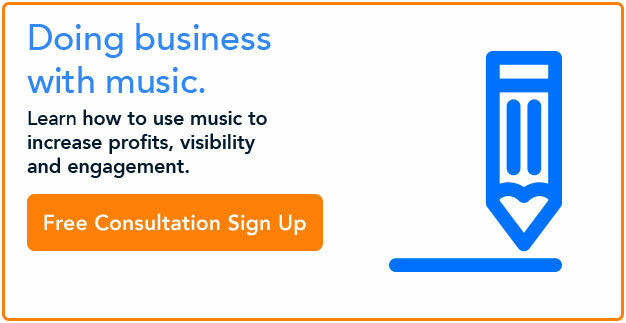 Click below for a FREE consultation to learn how to incorporate music into your marketing. Soundstr identifies the music broadcast in businesses to create transparency for songwriters and businesses alike.